Savoie is a French department (county) located in the Rhône-Alpes region of central eastern France, bordering Switzerland to the north and Italy's Valle d'Aosta region to the south. If you look at a map of Haute-Savoie and Savoie, you will realize that this mountainous region includes some of the greatest and family friendly ski resorts of the French Alps, like: Chamberry, Albertville and Chamonix. It also includes the town of Thonon-les-Bains, a highly reputed thermal station on the south central bank of the lake Geneva, near the even more renowned thermal town of Evian (-les-Bains). It is a beautiful, enchanting place to discover and to do some trekking during the summer. The region also offers some of the highest vineyards in France, producing mainly traditional, bright, crisp, mineral whites, complemented by a few light reds and roses made from local, quite unknown, indigenous grape varieties. Savoie's white wines are usually at their finest fresh, from the latest harvest, when they retain the mineral purity (almost like spring water on a mountain rock or mountain dew on the grassy meadow of the higher plateau), freshness, and floral aromas of an Alpine summer morning. The most planted local white grapes are Roussette (also called Altesse), Jacquère and Gringet, complemented with Chardonnay and Chasselas, though a few others are permitted including Roussane and Aligoté (and more). The reds and rosés are usually crafted with Gamay, Pinot Noir and Mondeuse (and more rarely but also existing Syrah and the Cabernets). Red wines from Savoie can be very pleasant if light, and high in acid but, too often, they are mostly undiscovered and especially overshadowed by the whites, usually more in favor to most consumers. Savoie also houses some sparkling wines: Vin de Savoie Pétillant and Vin de Mousseux (white and rosé), often produced from a blend of Chardonnay, Chasselas and Roussette. Bugey: produces mainly white, and a bit of red and rosé wines, but is somewhat more welknown in the US market for its Bugey-Cerdon (a earthy, refreshing, slightly-sweet natural sparkling rosé wine usually made made from Gamay, Pinot Noir or Mondeuse, and occasionally blended with Poulsard). Roussette de Savoie: made usually with mainly Roussette grapes (also called Altesse) blanded with Chardonnay (up to 50% depending of the producer and the desired final product) for the AOC only. For the AOC mentioning the name of the village or the name of a specific vineyard, (thus bearing the "cru" designation, i.e. : Frangy, Marestel, Monterminod and Monthoux), Altesse must be the only grape, no blending permitted. These "cru(s)" benefits of the best conditions and the best micro-climates, producing greater, even age worthy, wines. Crépy: a small, fairly unknown local wine area where the Chasselas grape is king, producing whites meant to be drunk young and fresh. Seyssel: here again, a small, fairly unknown local wine area where most wines are made with Altesse, producing whites meant to be drunk young and fresh, except some sparkling (Mousseux) made with other local grape varieties: 90% Molette Blanche and Chasselas, and 10% Altesse. However, among the many wines produced in Savoie, there are about fifteen "Cu" villages (comprised in the large "Vin de Savoie" region) that can add their name to the "Vin de Savoie" (i.e. Jongieux Vin de Savoie or Chignin Vin de Savoie). Some villages have also specific grape varieties that they use only in their village, and can add it to their name on the label (i.e. Mondeuse d'Arbin). The fifteen cru villages are: Abymes, Apremont, Arbin, Ayze, Charpignat, Chautagne, Chignin, Chignin-Bergeron, Cruet, Marignan, Montmélian, Ripaille, Saint-Jean-de-la-Porte, Saint-Jeoire-Prieuré and Saint-Marie-d'Alloix. The most recognized Savoie wine names, that you can find in the US, are: Chignin, Chignin-Bergeron, Roussette de Savoie, Altesse, Pinot Gris and Mondeuse Blanche (white, very rare) for the whites, and Mondeuse, Mondeuse d'Arbin, Pinot Noir and Gamay for the reds. More and more small distributors are focusing on the wines from this region that deserves a bit more attention. Ask your local retailer (me for example) for more details. For today, I will just recommend you to taste the following wine from Eugene Carrel. It is a great value for money and surely one of the most perfect entry-level wines to start learning a bit more about Savoie and its wines. Jongieux is a small appellation surrounding the village of the same name, located north of Chamberry, near the western bank of lake Bourget (Lac du Bouget). 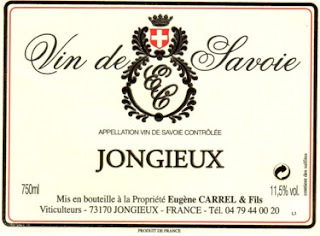 The vineyard of Jongieux lies on a plateau at an altitude of between 300 and 500 meters (and up) of altitude. The melting of an ancient glacier formed the plateau. Jongieux (and Jongieux le Haut) resides on the flank of the nearby mountain, known as the "Dent du Chat", separating the lake from the area of Jongieux. The Lake Bourget is one of the largest natural lakes in France, and it empties into the Rhône River. The Lake and especially the nearby mountains temperate the atmosphere, protect the vineyards, canalize the cold wind from the north and from the Alps to the east. All these factors create Jongieux’s unique warm micro-climate, forming an ideal ecosystem propice to grow vines, more especially the local, established and perfectly adapted Altesse and Jacquère grape varieties which excel in this mountainous environment. Eugene Carrel manages the 14th century estate and its vineyards with his son Olivier and his son in law Sebastien. Eugene Carrel is especially known for his "Roussette de Savoie Cru Marestel". Marestel is the only Cru (non-village but vineyard this time) of the Savoie region, due to its exceptional exposition and micro-climate. The Marestel vineyard roughly starts behind the village of Jongieux, and go up to the mountain, planted east-north-east, with a great west-south-western exposure ideal to fully ripen the fruit. The extremely steep upper slope (70%) faces southwest and receives favorable amount of sunlight to produce high quality grapes with proper phenolic ripeness. The curving of the slope and its exposition ensure that the late ripening and low-yielding Altesse grapes regularly ripen at over 13.5% alcohol naturally. The constant wind is a natural barrier against certain vine's diseases like mildew and rot, drying the grapes, but it also brings freshness. The soil is mainly composed of broken limestone rocks (forming some scree, also called talus) and small stones, formed and deposited by the glacier. This stony T-erroir, on slope with great exposure, ensure healthy and often perfectly ripe grapes because it drains well the rain and retains the heat of the day to restitute it at night. Resulting into aromatic, mineral, ripe, medium bodied, fleshy yet not opulent, fresh, crisp, dry and balanced white, red, rosé and sparkling wines. Winemaker from father to son, for 3 generations, Eugene Carrel et Fils (and sons) is a family own property of 22 hectares of vines, divided in several parcels and producing about 10 different wines: 1.66 hectares of Altesse (for "cru Marestel"); 2.55 hectares of Altesse (for Roussette de Savoie); 3.32 hectares of Jacquère (for cru Jongieux white); 2.82 hectares of Gamay (for cru Jongieux Gamay); 1.20 hectares of Gamay Vieillles Vignes (cru Jongieux Gamay Vieilles Vignes Cuvée Prestige -old vines-); 3.52 hectares of Mondeuse (for cru Jongieux Mondeuse and cru Jongieux Mondeuse élevé en Fût de Chêne); the roughly seven hectares left include the estate, some land and some younger vines. Along with the cited wines above, Carrel also produces a Rosé de Savoie (65% Gamay and 35%Mondeuse) and Vine de Savoie "Méthode Traditionnelle" sparkling white made with Altesse, Jacquère and Chardonnay. Most of Carrel's wines are vinified in stainless still tank to retain freshness and crispiness and to maximize the fruit aromas and flavors. A few of the wines are aged in oak barrels or partially used oak barrels to add extra dimension (volume if you prefer) and structure. I became a big fan of his wines a few years ago when I first tasted his 2006 Jongieux white. My love for the wines of Savoie (and also Jura wines) goes back to when I used to be a young Sommelier in Paris then in London (more than 12 years ago) where I had the chance and the privilege to open some fantastic bottles that open my eyes on the quality and the potential of these wines. Savoie’s whites (and reds) are ought to be discovered, the sooner the better and particularly during the warm season. In the glass, the robe has an ultra pale yellow-white color, almost as clear as water, with bright pale golden reflects. The nose is extremely fresh, dry and mineral with delicate scents of white flower, wet stone minerality, citrus and especially white fruit. The palate is very inviting and cleansing with a great juicy attack expanding nicely in the mid-palate with citrus, lime, unripe white peach, almost white grape fruit, flavors. The finish is super dry and refreshing, and call for another glass. Balanced by a lovely mineral touch and great acidity, this wine is the perfect summer white and a thirst quencher, particularly in very hot day. I love it. Bright and cleansing, one bottle won’t be enough if you share it during a late afternoon aperitif or even if you sip over some oysters, shellfish and grilled white fish. Madame Vivianne Länzlinger died 2011-12-02.